Heal the Bay's 22nd Annual Beach Report Card, issued in May 2012, found nine of California's 10 dirtiest beaches -- the "Beach Bummers" -- are in Southern California. Here are the worst offenders, starting with the dirtiest. California's second most-polluted beach, Cowell Beach in Santa Cruz, is not pictured. A Santa Cruz beach has once again topped a state list of most polluted beaches. Cowell Beach, near the Santa Cruz Municipal Wharf, received the worst score of all California public beaches on the annual Beach Report Card published by Heal the Bay, an environmental nonprofit. It's the third year in a row Cowell has been awarded the dubious distinction with an "F' grade. About 95 percent of all beaches received "A" or "B" grades this year, according to the Heal the Bay report. 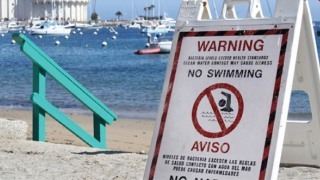 The report card bases grades on levels of weekly bacterial pollution in the beaches' water. Other area beaches among the 10 worst are Sunnydale Cove at Candlestick Point in San Francisco at No. 8 and Pillar Point near Half Moon Bay in San Mateo County at No. 9.